The keys words here are "perpetual" "irrevocable" "royalty-free" "license" to "SELL". Yes. By using ConvertKit you are giving them permission to sell or re-use your content for any purpose whatsoever with no payment due to you EVER. In response to these concerns a member of the ConvertKit marketing team pointed out similar language from other apps....NONE of which include the word "sell".....and stated the Terms of Service only covers content or comments submitted for the blog on www.convertkit.com and nothing regarding apps.convertkit.com where customers actually use the platform. I am not writing this to say ConvertKit is or even will in the future sell your content. BUT as a lawyer that specializes in contracts and drafting language like this IF ConvertKit decided to sell the content you put on the platform they would have a really good case to say you agreed to it based on how the current terms of service are written. Below is a snippet of the very first paragraph of the ConvertKit Terms of Service where it states the agreement covers use of ConvertKit on all platforms. Contract attorneys specialize in identifying language that tells you what they mean, what they don't mean and what they want to keep unclear. It does not say on all "devices" governing mobile, laptop, tablet, but instead it says all "platforms" The phrase "platforms" means anyway that you can access ConvertKit such as via hardware like your computer or software like an application such as apps.convertkit.com. 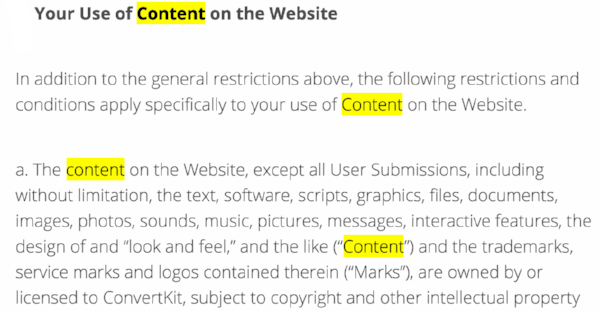 If ConvertKit intended for the Terms of Service to only govern www.convertkit.com there would have been no need to include the phrase "all platforms" but it did not. Their lawyers made sure to intentionally include those extra words and tell you what they mean when they use "Website" with a capital "W" just to reiterate they don't just mean the actual website itself but all versions of ConvertKit including the ConvertKit app. The team member stated content users are agreeing to give to ConvertKit for free is only meant to cover guest blog posts or quotes for blog posts and the phrase "User Submissions" means content submitted for the blog and comments together. It is important to take note that in contracts lawyers capitalize words to give them a specific meaning to make sure there is no confusion in what is and is not meant by the use of a generic word. Take for the example in the beginning where I mentioned ConvertKit makes sure to define "Website" as "ConvertKit on all platforms". If website only meant www.convertkit.com there would have been no need to define or capitalize Website but because they wanted to include all platforms (such as the app) they defined and capitalized the otherwise generic word of website. To break down this paragraph from the cloudy sentence structure it states that everything EXCEPT User Submissions is OWNED by ConvertKit. Now this may make you feel good and point out SEE LOOK IT SAYS EXCEPT USER SUBMISSIONS but if you have ever heard me talk about contracts I always tell you to look out for paragraphs that contradict. Again, I am not writing this to say ConvertKit is or even will in the future sell your content. But I am putting this information out there to show you that the small print you click past to use products you love really matters and could screw you big time out of the hard work, time, and value you put into the content you create for your audience if repurposed and sold by a big corporation.